They announced on Instagram that they will be working with a Canadian firm to build 550 cc two strokes for a bike and snowbike. These guys seems pretty serious about this two stroke thing. I missed the 100 HP claim they list in the first post. Pretty sure that's not going to happen, but if it did that would be insane. I'm hearing that the cost will be about 9-10k... Nothing is confirmed as far as I know..
And I've heard that the 100 hp is accurate at the crank.. But reality will show it's ugly head when they hit the market in volume. $6,400 for the e-start/kickstart model. Less if you want only one or the other. Is that just motor, or the whole bike? I'm guessing just motor, seeing as it's not made in China. The asterisks did not lead to anything, so I'm not sure what they were trying to say on the HP and torque. It will be pretty impressive if it comes anywhere close to those numbers. At least we can buy an American electric bike. Not getting my dollars anytime soon, but you may be forced to buy one in certain states like California in the near future. Surely they will couple some of that EFI technology from the snow mobiles to get those numbers? I exchanged some messages with the guys at GPX today, and they verified some information for me. The motor will be available in a chassis very similar to their 250, and the bike will retail for $10,000. The motor can be purchased separately and will cost $6,000. I asked him what size rear tire they would be going with on the bike, but I haven't heard back yet. I'll update the thread when I get more information. They must be getting the motor built by these guys? The picture on Instagram did have that logo on the clutch cover. 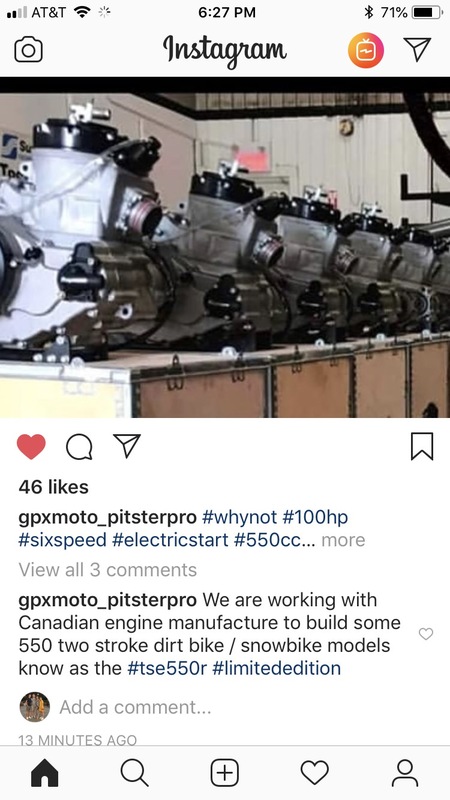 These are the same guys who are making the electric start for 500s, so it makes sense that they would want to make a whole engine. Good catch! I'm pretty sure they are not the same company.